The mission of this chapter is to discuss the glass ceiling and the contributing factors that seem to impact faculty members at HBCUs continuously; provide insight on effective strategies to avoid pitfalls, and to provide helpful recommendations to advance to new grounds once the glass ceiling becomes unbreakable. While steps have been made to examine the impact of a positive environment, the individual is ultimately responsible for personal growth in their chosen environment. 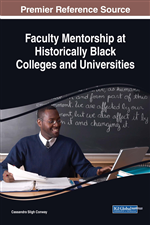 Many faculty members seem to experience stress and challenges while going through the tenure process and or moving up into administrative roles within the academic arena, especially at Historical Black Universities and Colleges (HBCUs). Several faculty members seem to lose the drive to fight and will tend to settle for lower ranks or non-tenure track positions, such as Instructor or Assistant Professor without attempting to apply for promotions. These individuals are very knowledgeable and highly skilled within the academic world; however, broken spirits of by previous failed attempts for advancement tend to overshadow these individuals. The author of this chapter is an Associate Professor and African American female employed at an HBCU. The pavement for success did not start after being hired as a junior faculty member. It started graduate school while pursuing a doctorate in health education. Program mentors provided support and guidance, along with stressing the importance of having a plan of action, developing achievable goals and establishing a timeline for accomplishing certain milestones before entering the world of academia. It was like a jump start to prepare the author for the tenure track journey. Without great mentors to guide and set the stage for the rigorous road ahead, promotion and tenure would not have been achievable. From the past and present stories shared during graduate school, most faculty recognizes that the advancement in rank from adjunct professor to full professor or even upper-level management can be very difficult, especially without proper mentorship. Even in the 21st Century, many females and minorities are still facing challenges relating to advancement on the job. It does not matter whether the job lies within the corporate world, academia arena, or with private employers, these challenges continue to exist. The term “glass ceiling” is used to describe the difficulties and barriers that many faculty members, especially minorities, encounter during the tenure process at institutions. According to the American Heritage New Dictionary of Cultural Literacy (n.d.), the definition of glass ceiling includes “an unacknowledged - and ultimately illegal - barrier to advancement, especially for women and people of color. In many careers, a woman cannot break through the glass ceiling to the upper level of management”. “This term dates to the 1980s” (American Heritage, n.d.). It was “not something that could be found in any corporate manual or even discussed at a business meeting; it was originally introduced as an invisible, covert, and unspoken phenomenon that existed to keep executive level leadership positions in the hands of Caucasian males” (Wilson, 2014, p. 84). The glass ceiling also allowed individuals to progress to a certain point within the professions before being blocked in spite of efforts to reach upper ranks. However, despite social movements and current laws, the reality of this invisible barrier continues to remain and contribute to the lack of underrepresentation of females and minorities in leadership roles (Chisholm-Burns, Spivey, Hagemann, & Josephson, 2017), especially in academia.